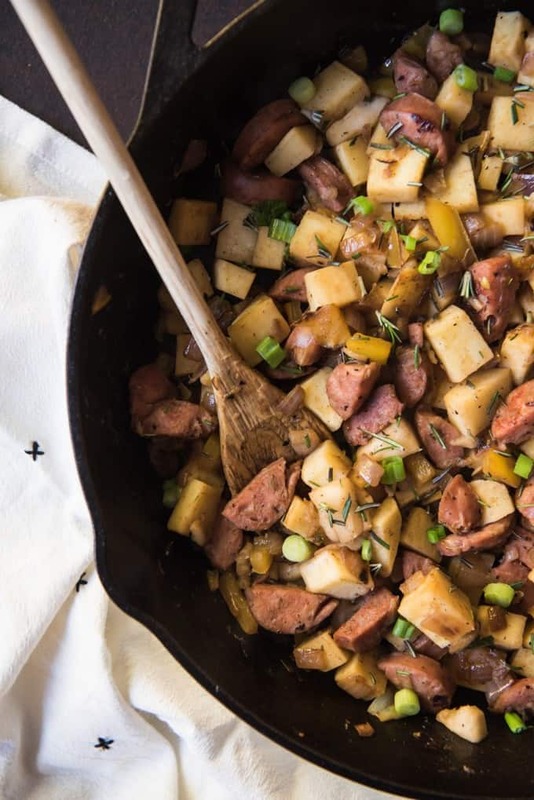 Sweet Potato Hash with Sausage & Apples is a good-for-you delicious, easy breakfast recipe to help you eat healthy in the new year! 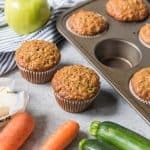 I eat it because it’s yummy, filling and a great start to my day, but it has the added benefit of being paleo, gluten-free, and Whole30 compliant! 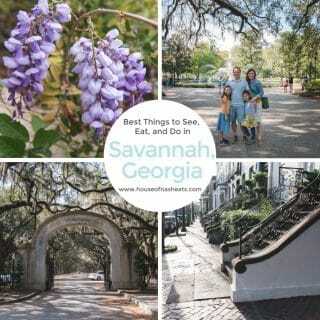 Welcome to the first post in the House of Nash Eats Monthly Cooking Challenge! In case you missed it, here are all the deets about the monthly cooking challenge that I’m introducing this year as a way to hone our skills in the kitchen and stir things up while having a fun project that let’s YOU share some of your creations! I’m guessing that a lot of you, like me, have set some sort of goal to eat better in the new year. Which is why the challenge for January is to cook healthier, good-for-you food! But a little clarification is probably helpful here. I’m not talking “diet” food or even the kind of things you might automatically think of when it comes to eating healthier. Healthier, good-for-you food doesn’t necessarily equate to “health foods” in my mind. 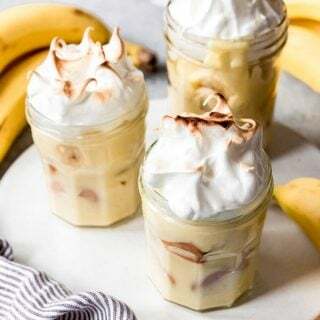 During this month, I’m going to be focusing on sharing healthier recipe ideas so that we can start the year off right! When it comes to eating healthy, I believe it’s important to focus on adding good-for-you foods into your lifestyle just as much as scaling back on “bad-for-you” foods. I’m definitely all about balance and not feeling guilt over enjoying a delicious treat now and then. But when I’m eating right – clean, healthy, meals that tend to incorporate some of my favorite veggies and plenty of protein – I do a lot better resisting temptation and sticking to a plan instead of grabbing the sweets that can be a strain on my resolve to eat healthier. My idea is to share with you food – REAL food, not “health” food – that will fit with a balanced lifestyle. 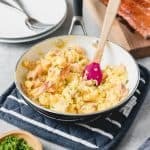 Dishes that you could easily and confidently serve family and friends because the flavor and deliciousness is there, even if some of the extra calories and not-as-good-for-you elements are gone. 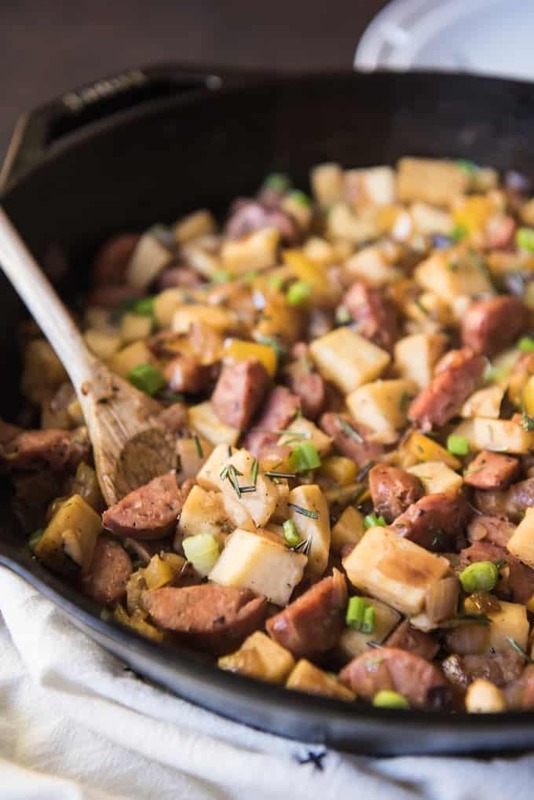 Meals like this Sweet Potato Hash with Sausage & Apples that is absolutely delicious for breakfast or lunch. One of the things I find most difficult when trying to eat healthier is getting in all the vegetables that I need during the day. 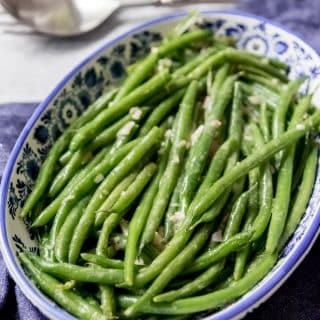 Even though I actually like most vegetables, it can still be a struggle for me to get in all the servings that are recommended! So when possible, I try eating vegetables for breakfast in ways that are delicious and satisfying, rather than making it feel like a chore. 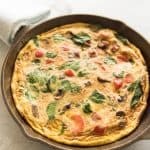 It’s an approach I’ve shared before with my favorite Ultimate Breakfast Frittata that is loaded with plenty of veggies and is another healthful breakfast option, made even more satisfying if you add a little cheese to it. And okay, sometimes I’ll blend a serving of spinach into a smoothie, although honestly, I’m not much of a smoothie person and typically only drink them out of necessity, like after a workout when I know I need the extra protein and can at least get in some extra nutrition by packing in the spinach as well. But a sweet potato hash is a great, easy way to get more vegetables in early in the day that I find much more satisfying and delicious than a smoothie! 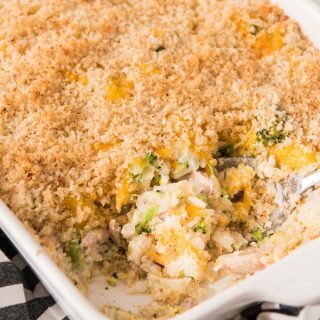 This dish is super easy to throw together using ingredients you have on hand, and it’s easily adapted to other flavors or vegetables by adding in spices or using different varieties of sweet potatoes. 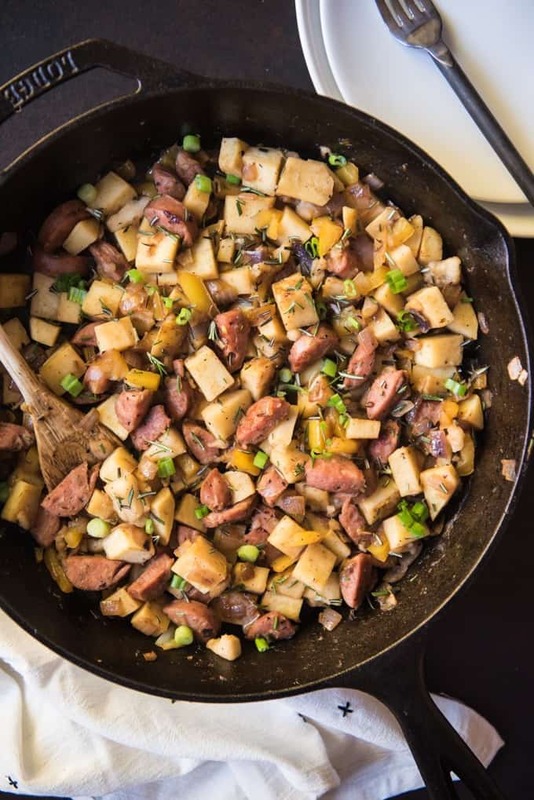 I used white sweet potatoes in this particular hash because it’s a fun change from the orange sweet potatoes. But both work equally well. I find that when I’m making a recipe like this that has quite a few different ingredients that need to be chopped or diced, it’s always best to get that out of the way first so that everything is prepped when it’s time to start cooking. 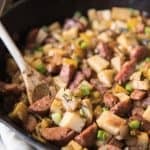 The hash starts out with just a small amount of oil used in a cast iron skillet over medium heat to cook peppers and onions just until they begin to soften. Then the sweet potatoes and sausages are added to the pan and cooked until the sweet potatoes just begin to soften so they aren’t crunchy, but also aren’t turning to mush. A good hash is as much about texture as flavor, I think. The apples and rosemary really set this particular sweet potato hash apart from others because they make the hash ever so slightly on the sweet side, while still being savory. 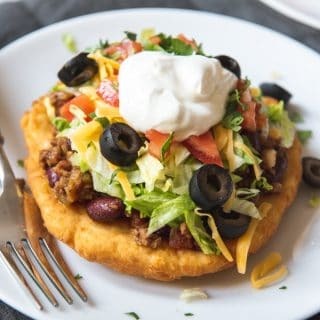 If you make this recipe or have another healthier meal that you love to make for your family, share your photos throughout the month using #honecookingchallenge on Instagram or email me, tweet me, or upload a photo or your recipe to my Facebook page! And please let me know if you have any questions about the recipe or the monthly cooking challenge! 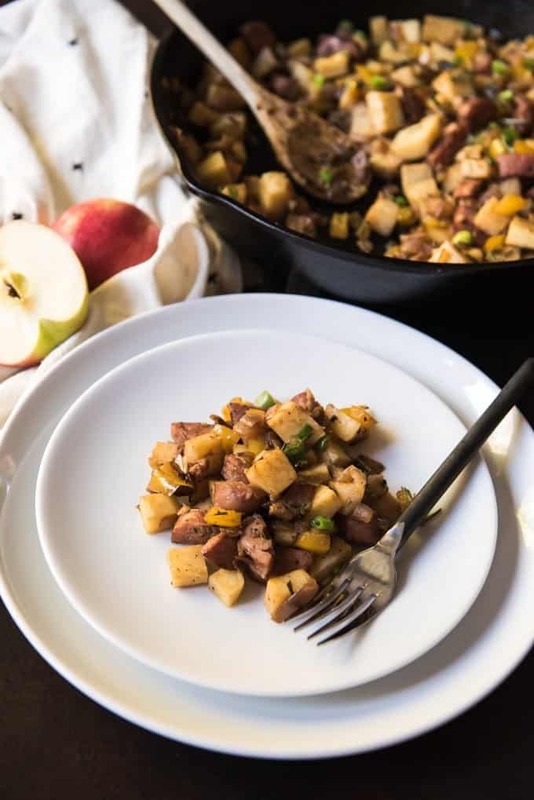 Sweet Potato Hash with Sausage & Apples is a good-for-you delicious, easy breakfast recipe to help you eat healthy in the new year! 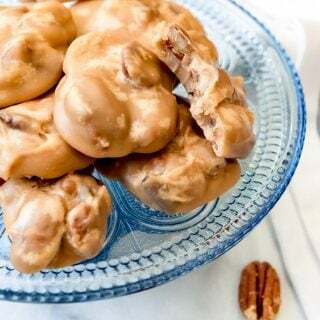 I eat it because it's yummy, filling and a great start to my day, but it has the added benefit of being paleo, gluten-free, and Whole30 compliant! Heat a large cast-iron skillet or nonstick pan over medium heat. Add the oil and wait until it is hot, then add the pepper and onion to the skillet and cook for 5-7 minutes, stirring frequently, just until they are beginning to soften. Add the sweet potatoes and sausages and cook, stirring frequently, for 10-12 minutes, until the sweet potatoes are beginning to soften and the sausage starts to brown a bit. Add the apples to the skillet with the rest of the hash and toss to combine, stirring frequently and continuing to cook for another 3-5 minutes, just until the apples are beginning to soften. Season with salt & pepper, to taste, and sprinkle with the fresh chopped rosemary, stirring everything to combine just before serving. 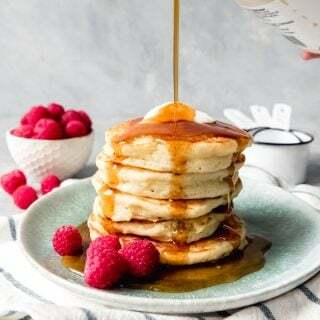 I’d be happy to wake up to this dish any day! This is such an awesome breakfast idea! 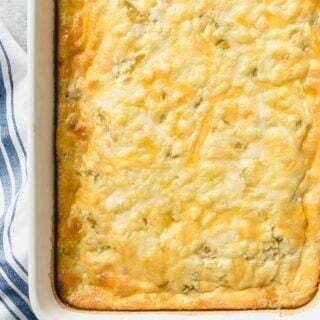 I have to make it for brunch this weekend!